It's that time again Sneak Peeks for the August 2013 Glam Bag should be coming out any day now. 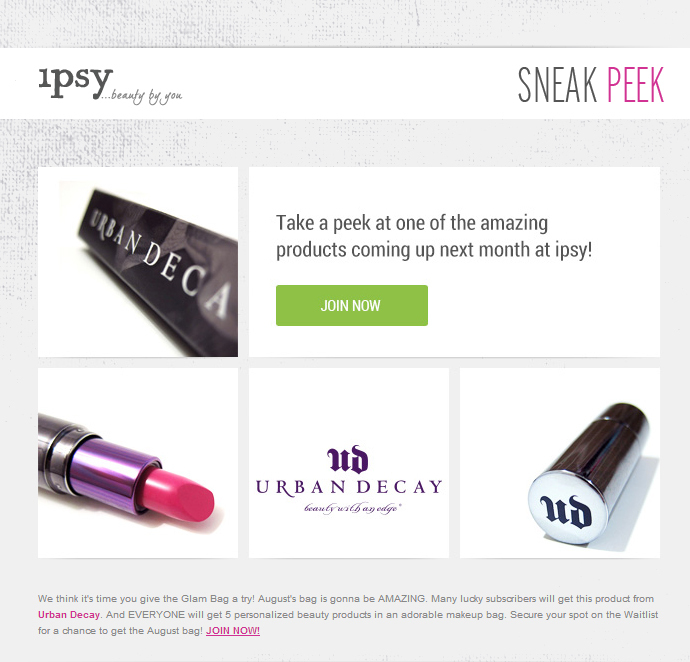 Check back to this post to keep up to date on all things Ipsy August 2013! In the meantime check out the new item they have added to the referral program, Lime Crime Nail Polish in Crema de Limon! Just received this email on my second account that isn't subbed yet! EEEEKKK Urban Decay Revolution LIPSTICK!! I may just sub my second account for hopes of getting one of these. AUGUST SNEAK PEEK #1: Pro-lips at your fingertips from start to finish with one of these awesome August Glam Bag items. 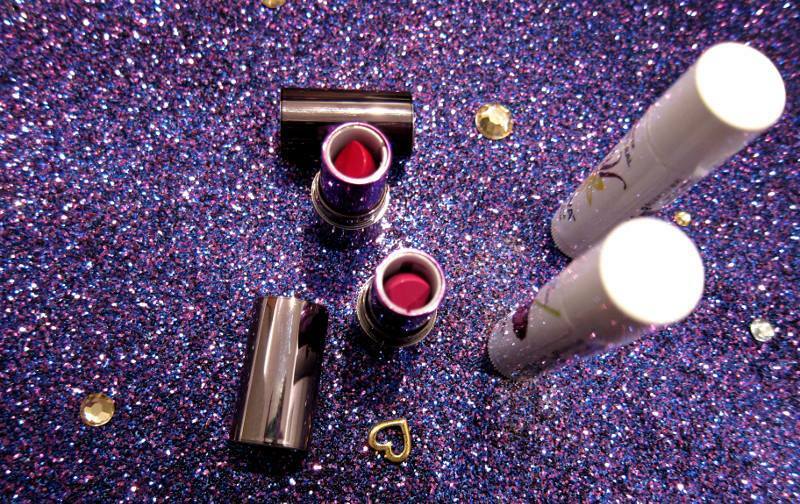 In this first sneak peek were seeing the Urban Decay Revolution Lipstick, that was also seen in the email sent out yesterday. The second item were seeing here is the Noya all natural Lip Balm, these are OR products so we could get one or the other. Personally I don't understand why they are making an OR product out of these choices. 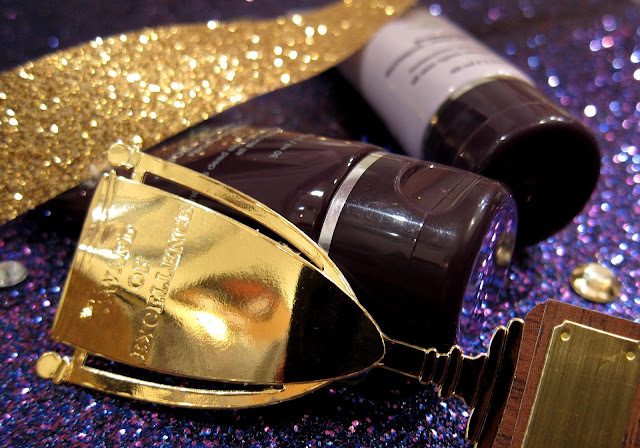 Urban Decay is a major player in the industry and Noya is relatively unknown. Now that is not to say that Noya is not good quality but on the scale of popularity I see most people wanting the Urban Decay Lipstick (myself included) and not a lip balm. I also really want the lipstick instead of the lip balm because it's 1st ingredient is Coconut Oil and I can no longer use that on my lips without having a painful reaction. 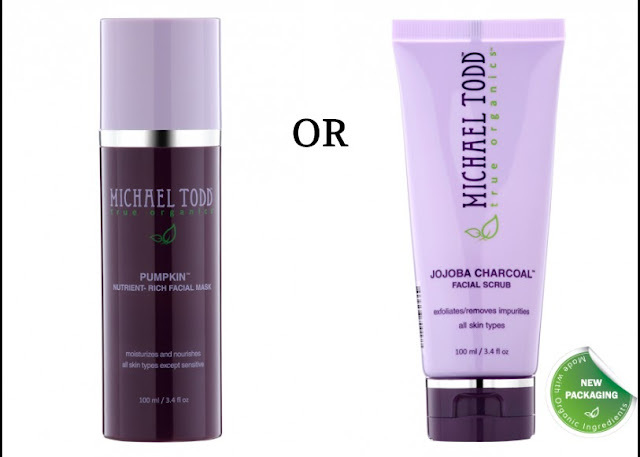 Sneak Peek #2 is out and these products are from Michael Todd Organics, they are "OR" products As far as I can find they will be 30 ml sample sizes of the Pumpkin Mask and Jojoba Charcoal Facial Scrub. 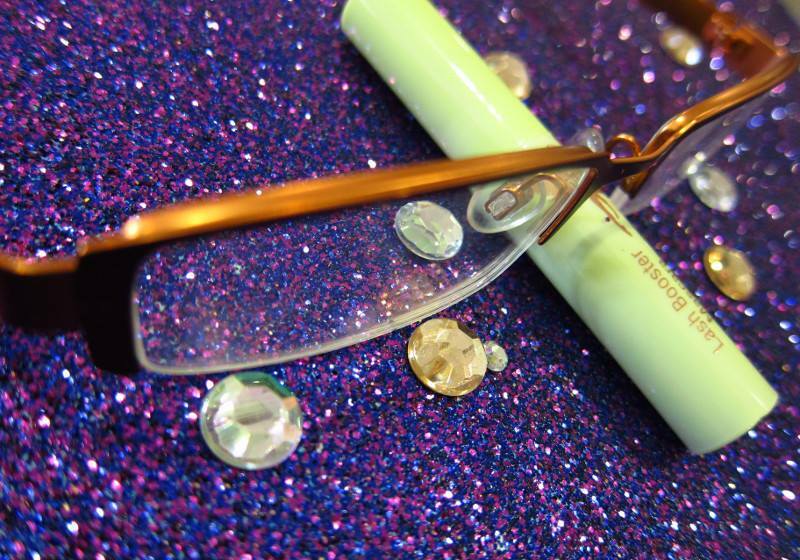 Sneak Peek #3 is out and this is the Pixi Lash Booster Mascara. This comes in two colors Blackest Blue and Blackest Black it is not yet known if Ipsy will send out both colors. The fifth and probably final sneak peek for August just came out featuring this month's bag! I get a Harry Potter meets the beauty world kind of feel to it. I think the theme this month is back to school. I am loving that nail polish! love the color of that polish! Me too! *fingers crossed* I have enough referrals this month. What about you? 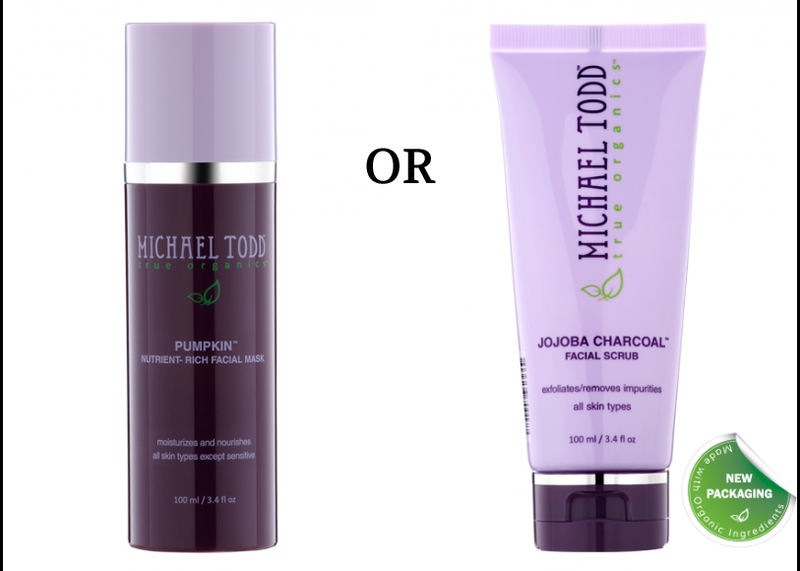 I haven't tried any of their products but I have heard a lot of buzz about them over the years. Whats your fave product from them? I have I really want a lot of their colors but I've managed to behave myself and not buy them so far. lol YES the velveteen is awesome I hear they are coming out with a new one called pink berry sometime soon too! Lol! Same here! I've managed to behave well and have not ordered from them yet. OMG I can't wait to see this pink berry one! It sounds so pretty! OMG!!!! I am crossing my fingers and toes that we will all get one!!! I've been wanting to get my hands on their lipsticks too!!! "Many lucky subscribers will get this product from Urban Decay and EVERYONE will get 5 personalized beauty products in an adorable makeup bag." Seriously *fingers crossed* I get it still my profile is set up for lip stuff and the past few bags I have gotten at least 2 lippie items. Aw shucks! Well I hope you get one hun! I've gotten a lippie item in every bag since when I first subscribe which back in may so I hope to be a lucky one too =) I'm anxious to see what else ipsy has up their sleeves for August! Hi love! Have you gotten your bag yet? Mine got transferred to USPS this early morning. I should be getting it tomorrow or Wednesday the latest! 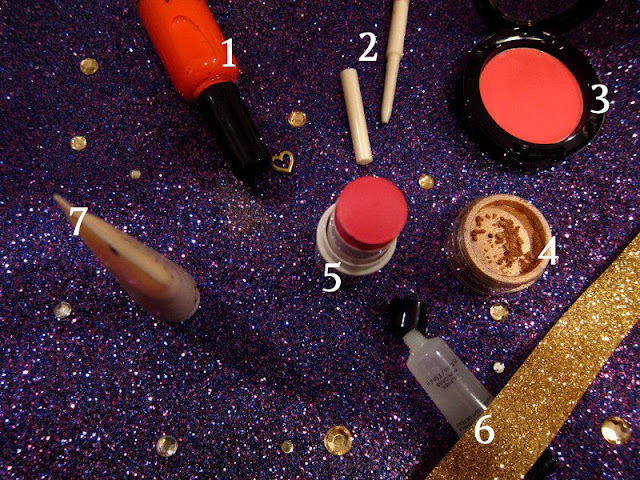 *cross fingers* Did you check your Glam Room to see what you are getting? I just thought I'd come back to tell you that I didn't get a UD lipstick =( I hope you did though! Let me know how you like the lippie okay! I wanna make sure it's something that's worth the splurge! lol! I haven't it's been hanging out in Texas :( I hope you get yours asap! I did check my glam room says I'm getting the UD lipstick, mascara, mica eyeshadow, jojoba scrub, and BB cream. Sad you didn't get a UD :( I don't think it's fair how they are giving them out tbh everyone should have gotten one I think. I will let you know if it's worth the money. Oh yay!!! You have the perfect bag! I'm happy that you get to test out the UD lippie for us! I'm getting mascara, eyebrow pencil, face scrub, lip balm, and bb cream. Since it's in Texas, I wish I could grab your bag for you and just magically hand it over to you thru the internet! lol! It's been so hot here in TX too! It's been in the high 90's even hit 101 and 102. I hope that our products aren't melting in this heat! Omg girl, so I got my bag today! Kinda upset because my Glam Bag is missing the bb cream! No wonder why my bag weighed 0.296 (DHL). I just emailed Ipsy and so I hope that they will reply back asap. Kinda bummed that I didn't get the UD lippie and then now I'm short of a product. Sorry for my rant love. Just needed to get it out. Have you ever had any issues with Ipsy before? I didn't think to ask that when I sent them an email! Lol but that is a great idea love! I'm sure Ipsy must get a lot of emails to go through, I just hope the turnaround for my case will be fast =/ Will keep you posted on their customer service! I re-subcribed in hopes that i can get the lipstick but im on the wait list. I hope its not long! I JUST received an email informing me that I am now off the wait list (I signed up in the beginning of July.) Naturally, I immediately came over here to check out if you had a post with this month's spoilers up and you do. You're good like that. So yeah, off the wait list and this will be my very first month with ipsy. I am so, so excited--and you should have me listed as one of your referrals for this month. Also, I know I'm the minority here, but I'd rather get the lip balm than the lipstick! I'm so glad I check here for your spoilers every month! Urband decay! Eeep! Oh wow...so tempted right now! Must resist!!!!! 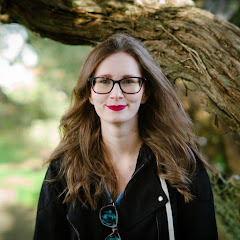 i totally agree with you about choosing between Urban Decay lipstick and the Noya balm! I can see how there will be a lot of upset and frustrated fans of ipsy if they miss out on the lipstick since it's had such a popular and long awaited launch :( I would be so disappointed not getting the UD lipstick.